This level has medium difficulty. 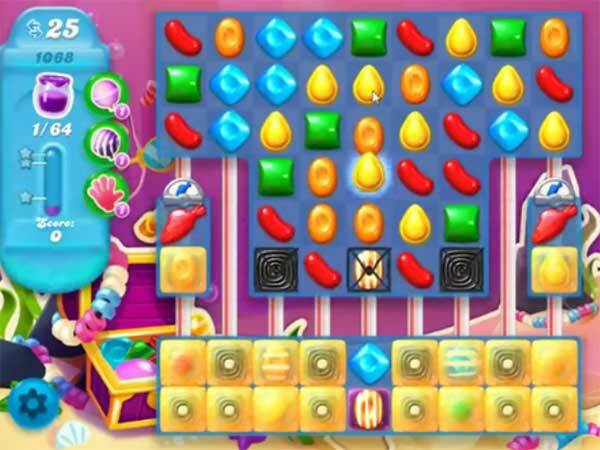 For this level try to play from top part of the board and make striped candy as you get the chance. Combine them with each other to break more blockers. Use striped candy to break more blockers that are in corner to spread the jam. Or play with remaining jam candy to spread them to near candies. ok, we now have 30 moves but the bottom row takes three hits to clear instead of two. I have played it 8 times and have never gotten a play on the bottom row. I have had a stripe/fish or two go down there but never three colors in a row. Most of the fish stay on top until jam is cleared. The best I have done is 48 jams–16 to go.